High Quality GRP Industrial Water Storage Tanks - Call Now For A Quote! Hot press sectional tank with externally flanged sides and base and base levelling steels. Dewey Waters are delighted to have been selected and trusted with this large maintenance project, on both tight and critical timescales. 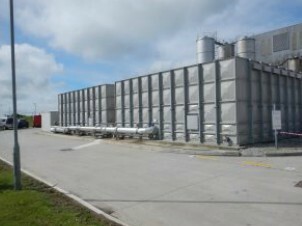 The factory, located in Davidstow, is Dairy Crest’s largest cheese-making creamery producing both Cathedral City and Davidstow brands of Cheddar cheese. 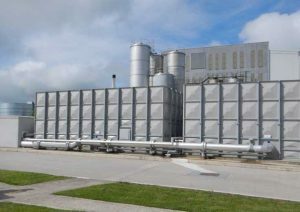 The two large process tanks were starting to fail and so the decision was made by the client to carry ou essential maintenance works during the low production month of July. The subcontract order was received on 18th June, installation scheduled to commence on site on 29th June and all works to be completed by the 31st July. The challenge had now begun to produce technical drawings and manufacture all of the panels for the two 19 x 10 x 4m high – 760,000 litre tanks. That’s a total of 1340 panels, ladders and ties bars, along with all the packing and wrapping in just over a week! Our already busy factory production went into overdrive to meet the delivery date and are pleased to confirm that on the 29th June, our crew of 10 were on site to meet the two full lorry loads of panels and connections and begin the installation. Due to the extremely tight deadlines, our crew were working throughout the weekend to achieve the dates set in the programme. Local accommodation was obtained where they stayed until the installation was completed. Although the factory was going through a low production month there was still a need for water storage. The tanks were required to be replaced in the same location and so the first tank had to be completed and put online before the strip out of the second tank could begin. There was a down period whilst this was being completed and we made the decision to stay on site throughout the second strip out in order to complete any preparation possible and to be on hand to commence the install of the second tank as soon as the site was ready. As expected on a project of this size, we encountered small site issues along the way which we successfully overcame, including sending an additional crew of 4 to site to pull back lost time. We are extremely proud to have achieved everything set out by our client particularly under such time deadlines. If you have a site that requires more specialist project management or a complex design please contact our technical sales team who will be able to confirm how Dewey Waters can assist you.